Lagoons are considered one of the most important habitats in the life of a steelhead. As young fish, steelhead migrate downstream towards the ocean. If the river has a lagoon, they will stay in the lagoon for a few to many months to feed and grow. Fish reared in a lagoon are much larger than fish of the same age reared upstream and this makes them much better able to survive when conditions are right to enter the ocean. Steelhead returning as adults to the Carmel River can spend from a few minutes to several days in the lagoon acclimating to freshwater or waiting for river conditions to be suitable for upstream migration. The Carmel River lagoon was once a prime steelhead lagoon, but partial filling in of the historic area of the lagoon for agriculture and housing along with over-pumping which robs the lagoon of fresh water in the summer and fall has created a lagoon that at best only partially provides what is needed to raise thousands of young steelhead. In August of 2008 CRSA noticed the level in the lagoon dropping to a critical low of just over 3 feet NGVD. Knowing that we had rescued over 14,700 fish from just the mainstem Carmel River, and knowing we had relocated a great many of these fish to the lagoon, something had to be done. 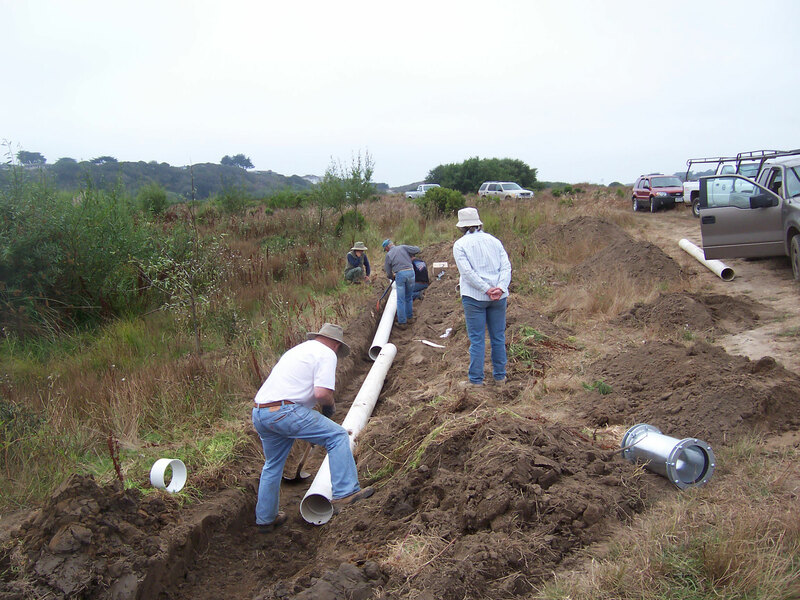 CRSA contacted State Parks for permission to reactivate the well on the former Odello artichokes field to provide supplement fresh water to the lagoon. 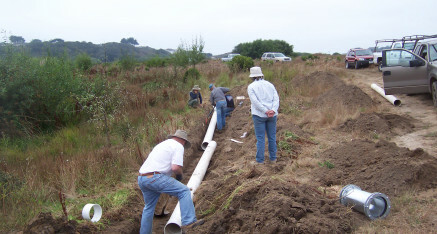 Although the well had not pumped water for over 12 years and the agriculture field had been reworked to provide riparian habitat, CRSA decided it was worth the effort to get the well running and find the broken water lines. At no charge to CRSA, California American Water sent two of their well experts to the Odello well and got the pump running again. A CRSA member brought his backhoe to the site for CRSA to use. During the following two weeks CRSA located and repaired a missing sixty foot section of water pipe and countless breaks in the line. After 380 hours of work by CRSA and State Park volunteers and $3,000.00, on August 28, 2008 approximately 500 gallons of cool fresh water per minute began flowing into the south arm of the lagoon. 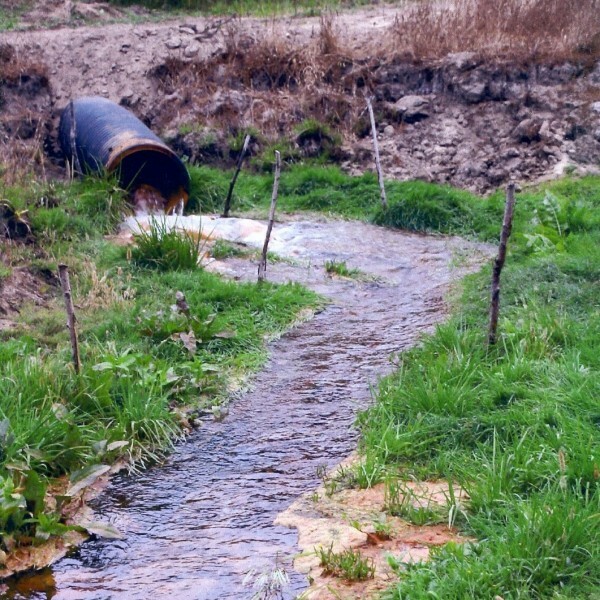 State Parks paid the electrical bill to run the well 24 hours a day until the river ran on February 16, 2009. It would be impossible to determine just how much the supplemental water helped to save fish, but considering that in some past years most fish died because the lagoon had become anoxic CRSA firmly believes supplemental water in 2008 saved thousands of steelhead. An anecdotal effect of the pumping was that a day after the pump was turned on CRSA members noticed several Kelts nosing right into the fresh water stream entering the lagoon, reaping the benefit of fresh, cool, oxygenated water.